The Nokia N8 display features a 3.5-inch (89 mm) 360 x 640 pixel color touchscreen, 720p HD recording camera, and is the first Nokia smartphone to run on the Symbian^3 operating system with single-tap interaction, featuring the addition of multiple home screens, multi-touch capabilities with gesture support. Among its connectivity features are HDMI out, Dolby Digital Plus sound, and Wi-Fi 802.11 b/g/n support. And this The Nokia N8 is also a great media player which supports a lot of media formats including files with DivX, XviD, MP4, H.264, H.263, WMV as video codec and MP3, WMA, WAV, eAAC as audio codec. So if you get a Nokia N8, you will be so lucky to watch movies up to HD 720p everywhere. 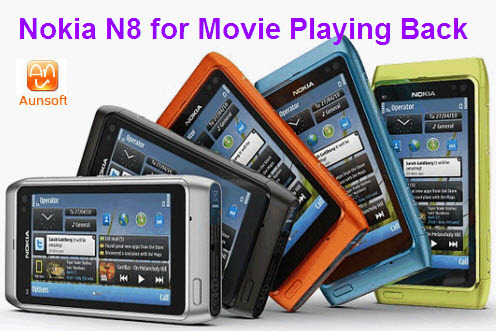 In order to help you make full use of your Nokia N8 movie playing function. Aunsoft Nokia N8 Video Converter is designed to give you more choice to enjoy kinds of movies. It supports to convert videos to H.264 MP4 for Nokia N8, including but not limited to TiVo videos, MKV videos, VRO, WMV, TS, TP, MTS/M2TS videos, VOB videos, AVI, HDTV TP files and RMVB videos. Have a look at the steps below to convert videos like TiVo/MKV/VOB/AVI/WMV to Nokia N8, and output movies up to HD 720p resolution or 640*360 pixels aspect ratio. Step 1. Load videos or HD videos like TiVo/MKV/VOB/AVI/WMV to Aunsoft Nokia N8 Converter. Run Aunsoft Video Converter as the perfect video to Nokia N8 Converter, and click the "Add" button to load videos in formats like .tivo, .tp, .vob, .ts, .mkv, .wmv, .mts, .avi, .rmvb. Step 2. Choose H.264 MP4 or 720P HD MP4 format for Nokia N8. Step 3. Convert videos to MP4 for Nokia N8. Click the convert button under the preview window, and the conversion from TiVo/MKV/AVI/WMV/VOB to H.264 MP4 for Nokia N8 starts immediately. After conversion, just transfer/sync your converted MP4 to Nokia N8 for enjoyment.